Many books come through the Gladys Brooks Book and Paper Conservation lab, and often they receive minimal stabilization, or are rehoused in new boxes or folders. Occasionally one comes through that is in need of an entirely new binding, and requires some research before getting started. Les Oeuvres d’Ambroise Paré, before treatment. Click to enlarge. This copy of Paré’s Les Oeuvres d’Ambroise Paré came to the lab in rather sorry shape; it is a 17th century book that had been rebound at some point in its past. 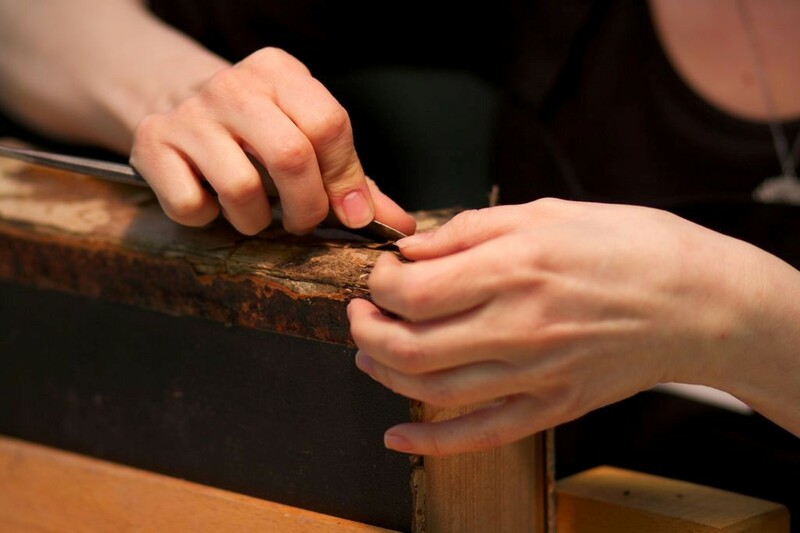 The new binding, or cover, was clearly made centuries after the book was created, and was damaged to the extent that handling the book was very difficult. 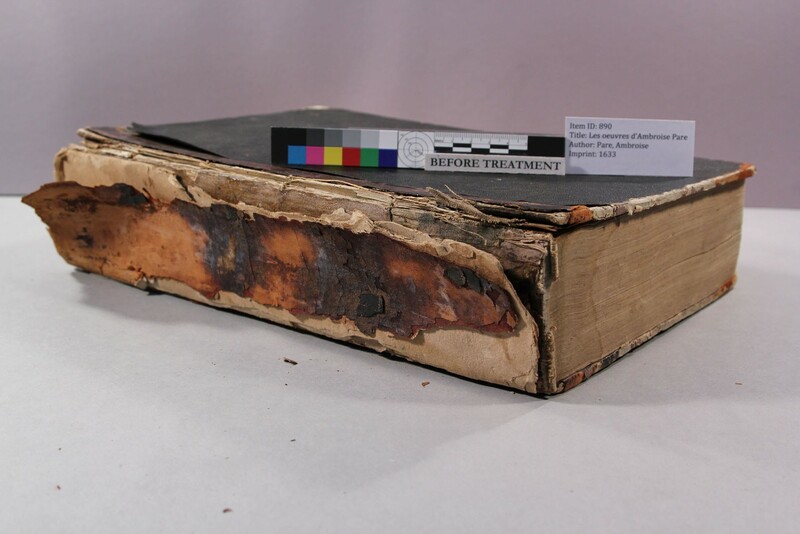 The usual practice in conservation is to use as many of the original parts as possible when repairing a book; in this case, however, the binding was not only heavily damaged, but inappropriate, so the decision was made to make a new binding for the book. What kind of binding would be appropriate for a 17th century French book? Beyond historical appropriateness, we had to consider the functionality of the new binding as well. It is a rather large, heavy book; what would be best for a book of this size? How often would this book be used? How would it be stored? We began with the first question of historical appropriateness. We are lucky to have access to the library’s rare book collection, and were able to find other books from the same time period and location, and study their bindings. We also made use of our large collection of books about binding history, researched other libraries on-line bindings databases, and talked to colleagues. Models of “semi-limp vellum” bindings. Click to enlarge. 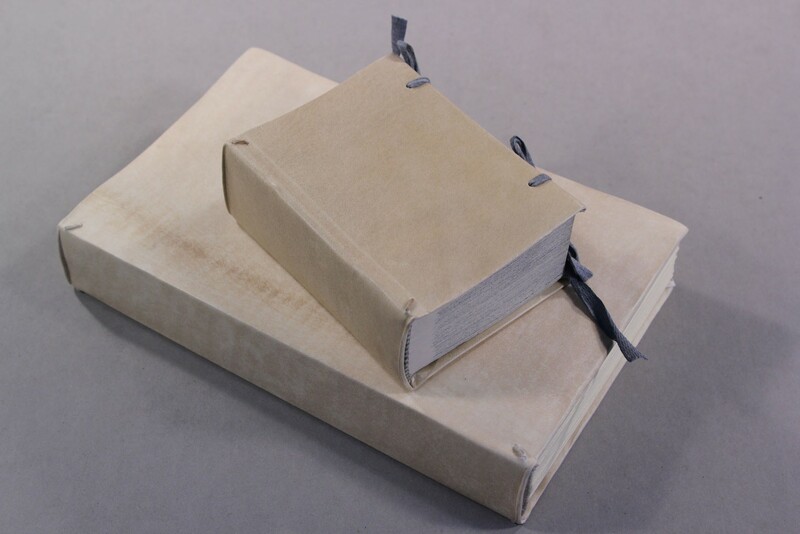 With these things in mind, we decided to explore the possibility of making a variation of what is called a “semi-limp vellum” binding. Such bindings are commonly used in conservation, for their historical appropriateness and functionality. With a little digging, a picture started to emerge for us of a typical French, 17th century vellum binding. We did not find a lot of details about how these bindings were made, however. It was very helpful to make a few small models before tackling the original book, to work out these details, and try variations to understand differences in functionality. With all the knowledge we acquired from these models, and from our research, we can now approach this treatment with confidence. Les Oeuvres d’Ambroise Paré will have a well-thought out new binding which is faithful to its time period, and will protect it well, for years to come. Check back to read about the final stages of treatment and see pictures of the book in its new binding. This entry was posted in Collections, Conservation and tagged book conservation, bookbinding, historical collections, rare books by nyamhistofmed. Bookmark the permalink. Fascinating! I can’t wait to see how it all turns out.